Heat oven to 350°F. Cook lasagna noodles as directed on package. Drain; rinse with hot water. Meanwhile, in 10-inch skillet, cook ground turkey and garlic over medium-high heat, stirring frequently, until turkey is no longer pink; drain, if necessary. Stir in pasta sauce, Italian seasoning and fennel. Reduce heat to low; simmer uncovered about 15 minutes, stirring occasionally. In small bowl, mix ricotta cheese, carrot, spinach and egg whites. Spread each cooked lasagna noodle with generous 1/4 cup spinach filling to within 1 inch of one short end. Roll up firmly toward unfilled end. Reserve 1 1/2 cups sauce. In ungreased 12x8-inch (2-quart) glass baking dish, pour remaining sauce. Arrange roll-ups, seam side down, in sauce. Pour reserved sauce over roll-ups. Cover tightly with foil; bake 30 to 40 minutes or until hot and bubbly. Sprinkle with mozzarella cheese; bake uncovered 3 to 5 minutes longer or until cheese is melted. Let stand 5 minutes before serving. 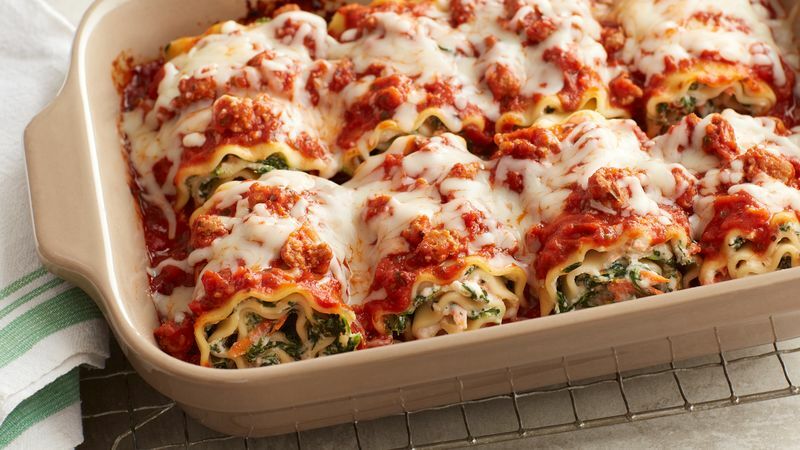 Spread lasagna noodles with 1/4 cup spinach filling to within 1 inch of one short end; roll up firmly.